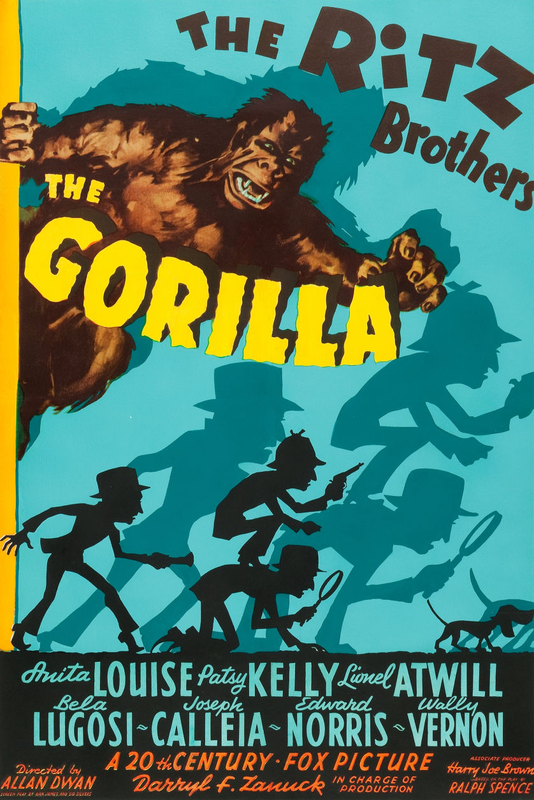 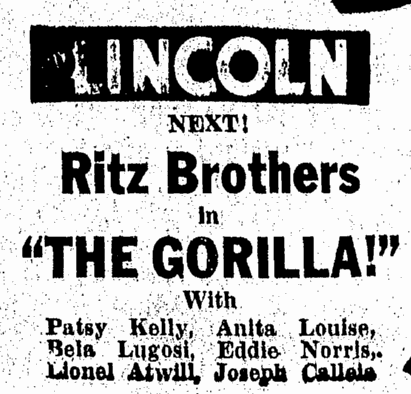 The Ritz brothers are set to star in “The Gorilla” as soon as they return from a personal appearance tour. 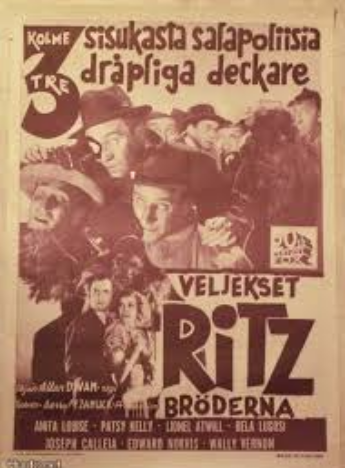 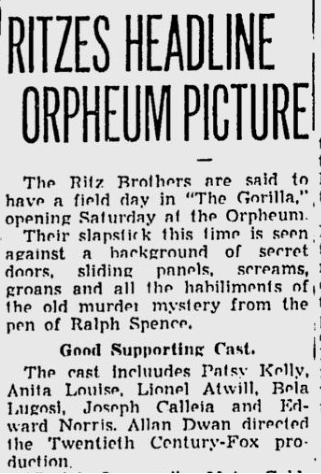 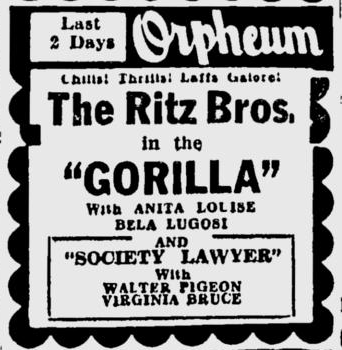 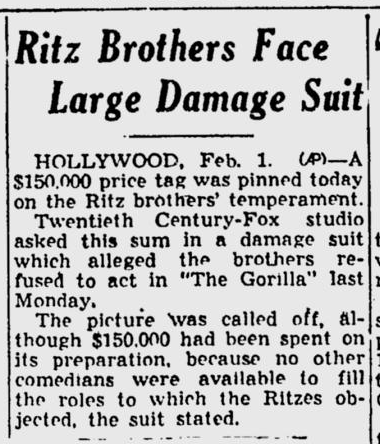 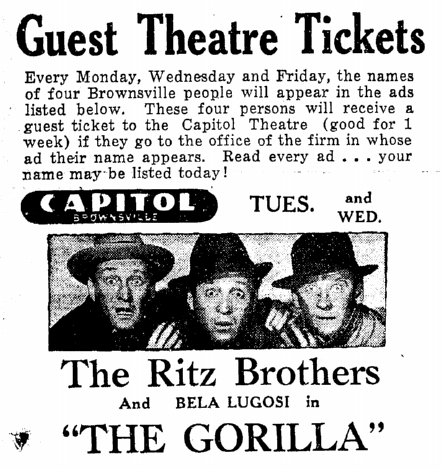 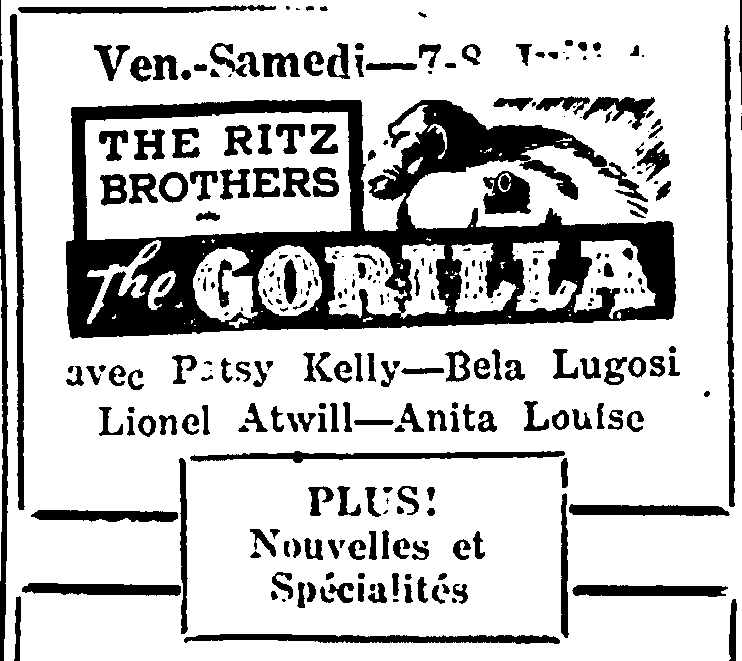 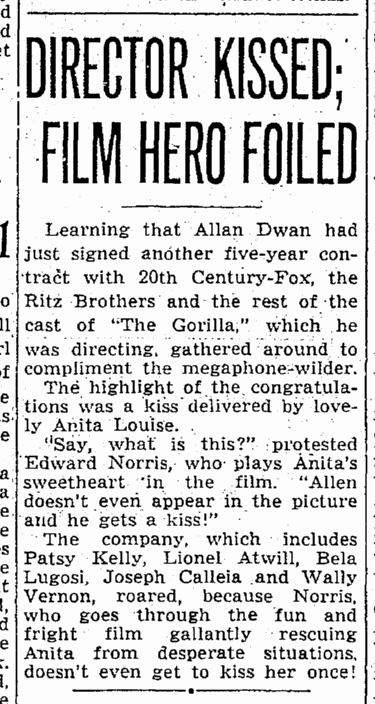 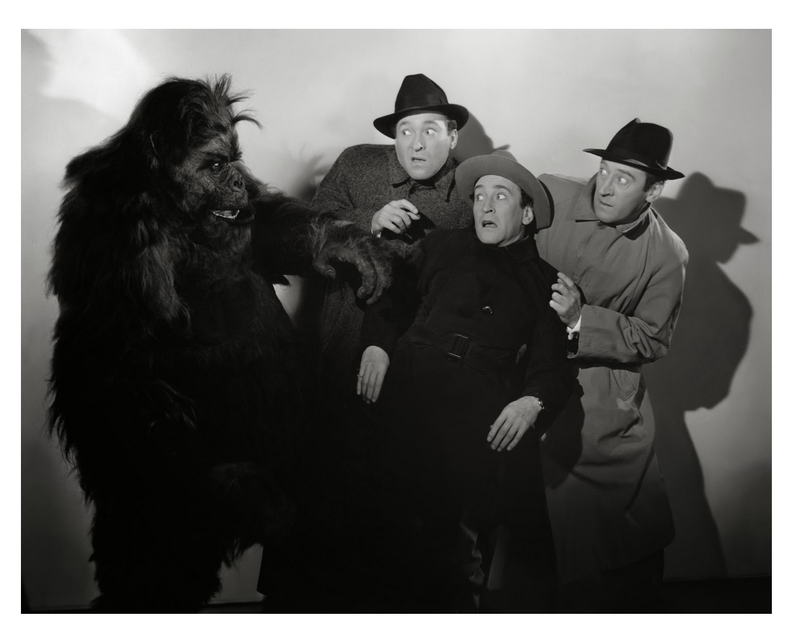 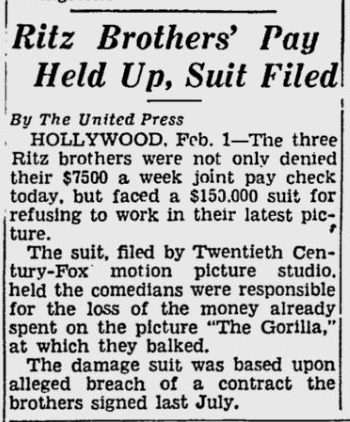 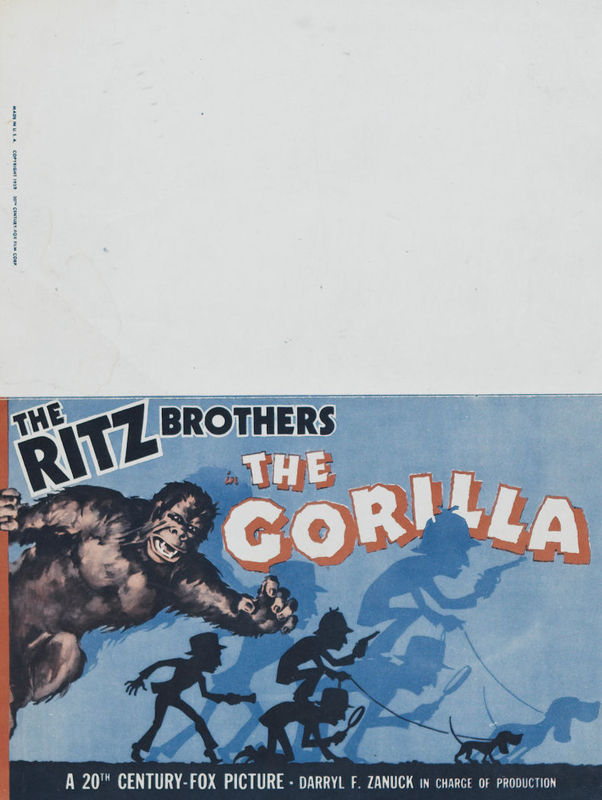 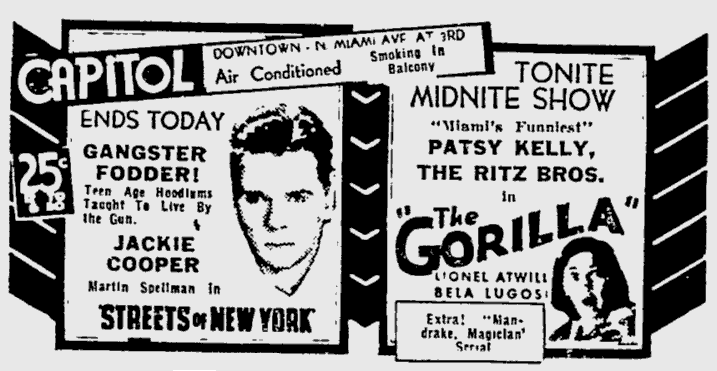 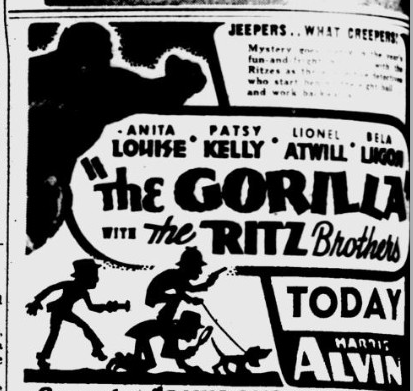 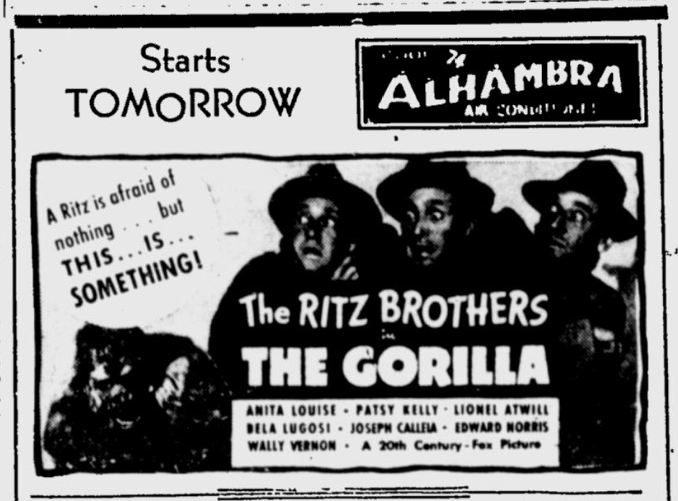 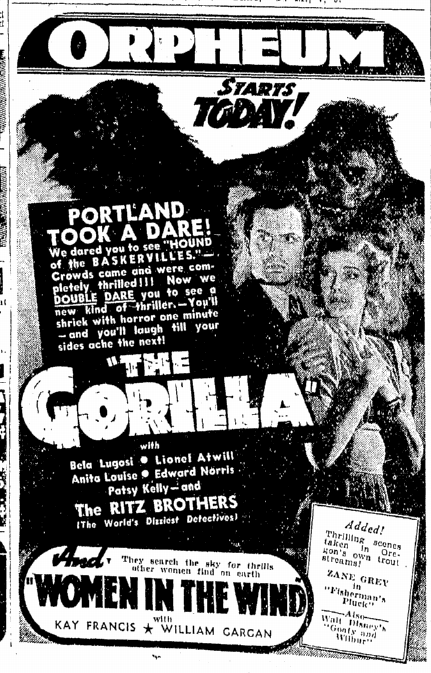 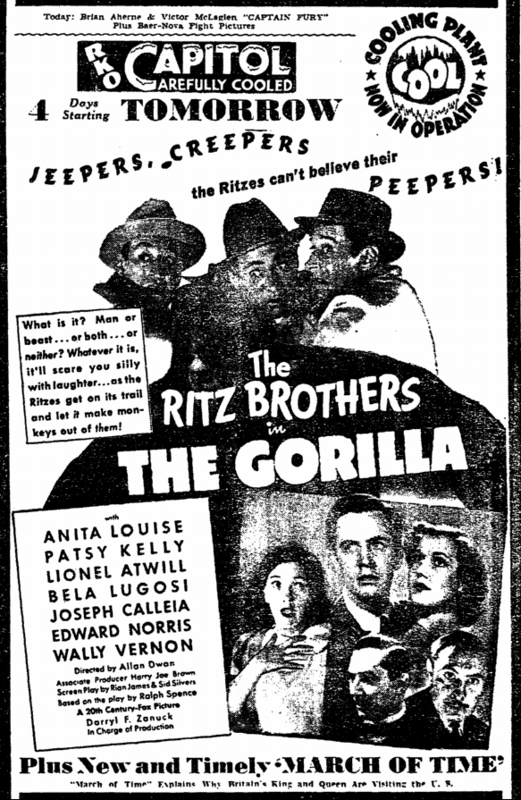 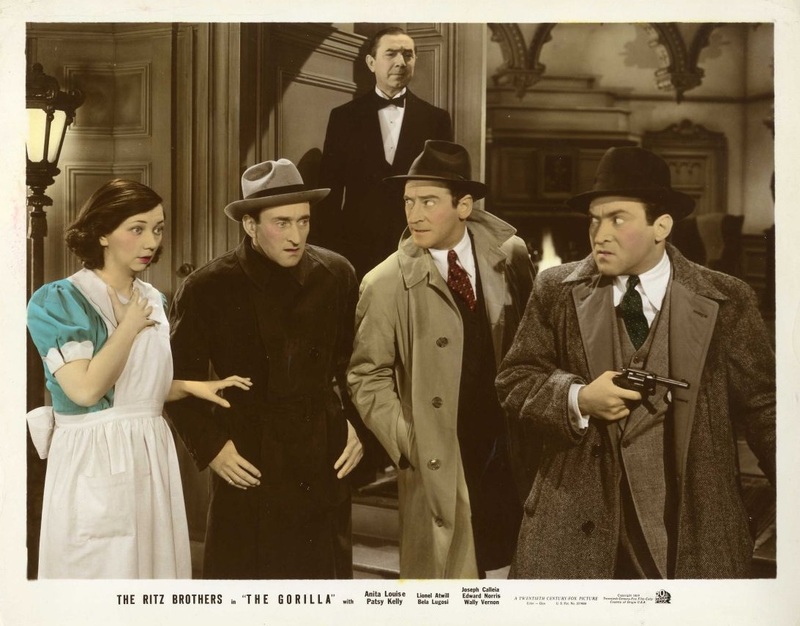 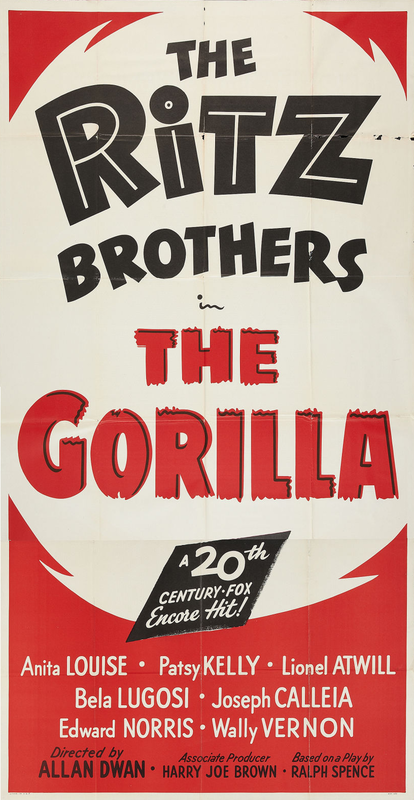 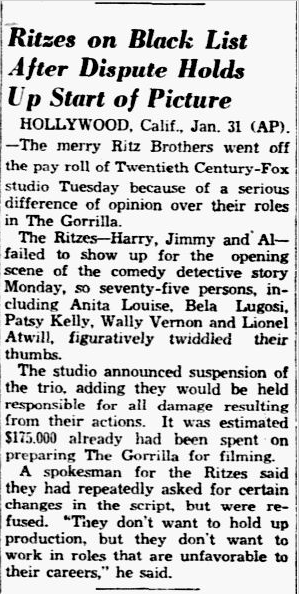 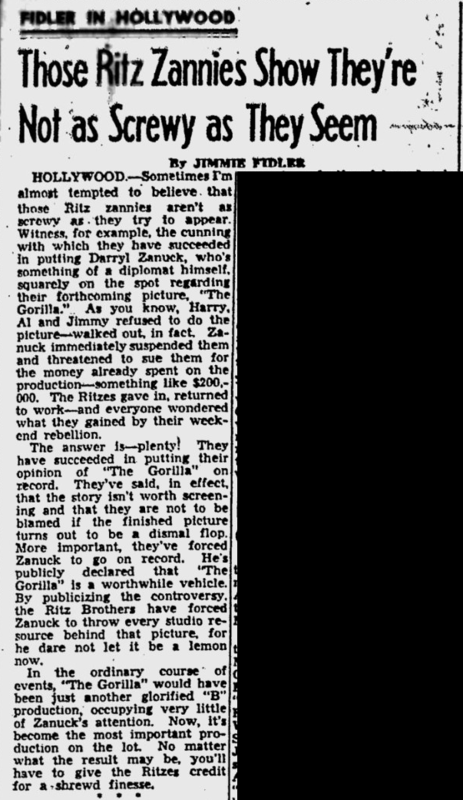 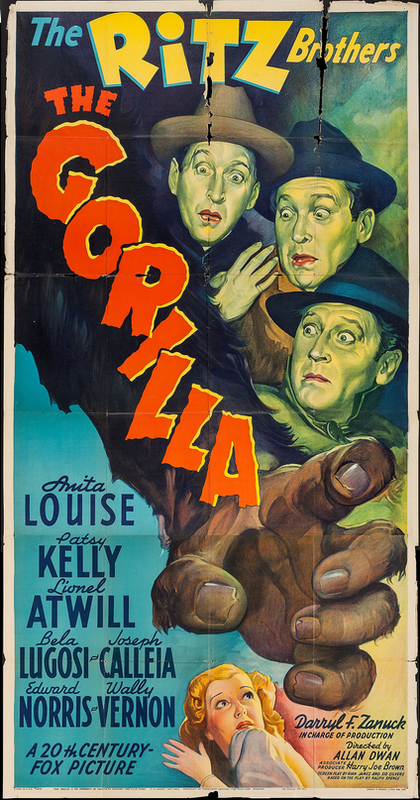 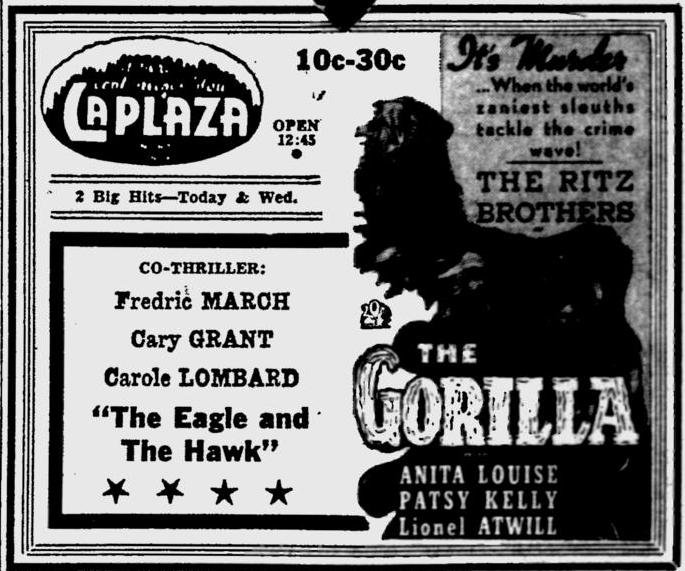 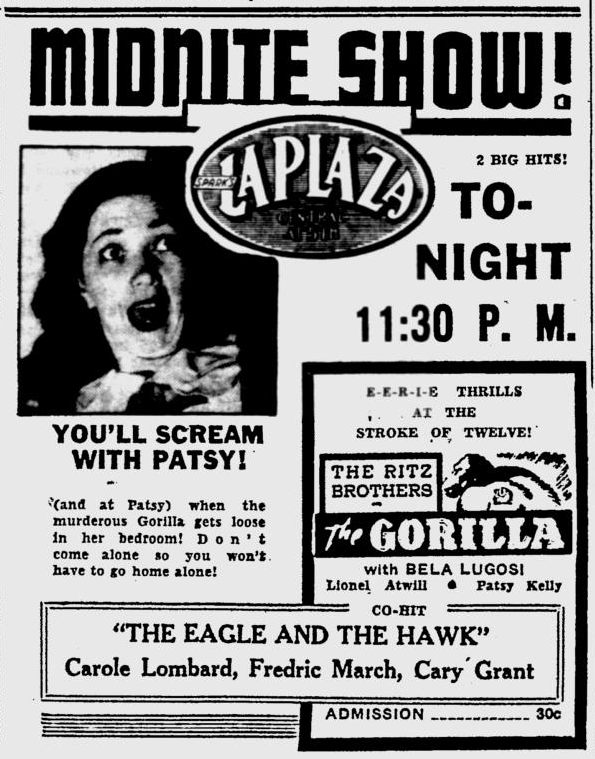 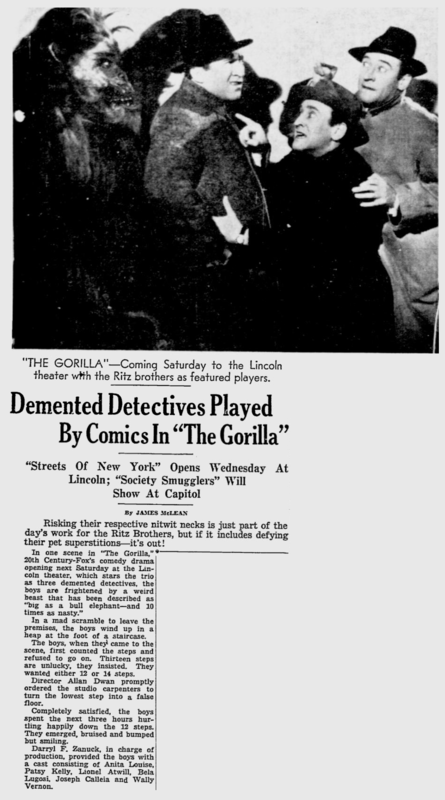 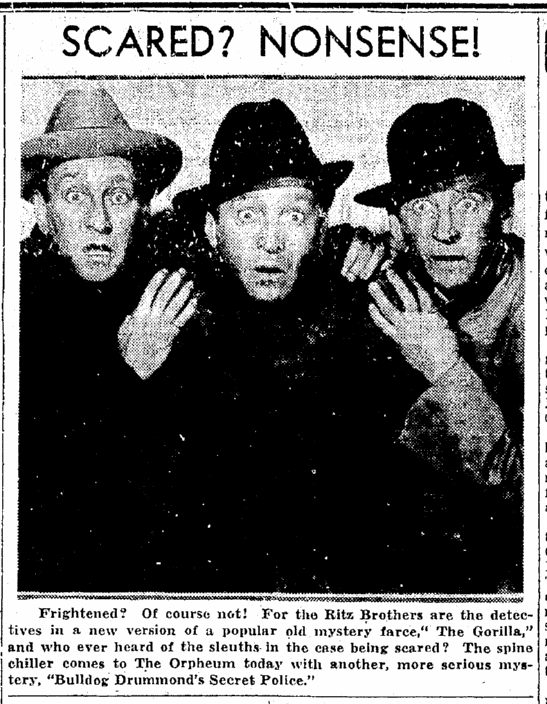 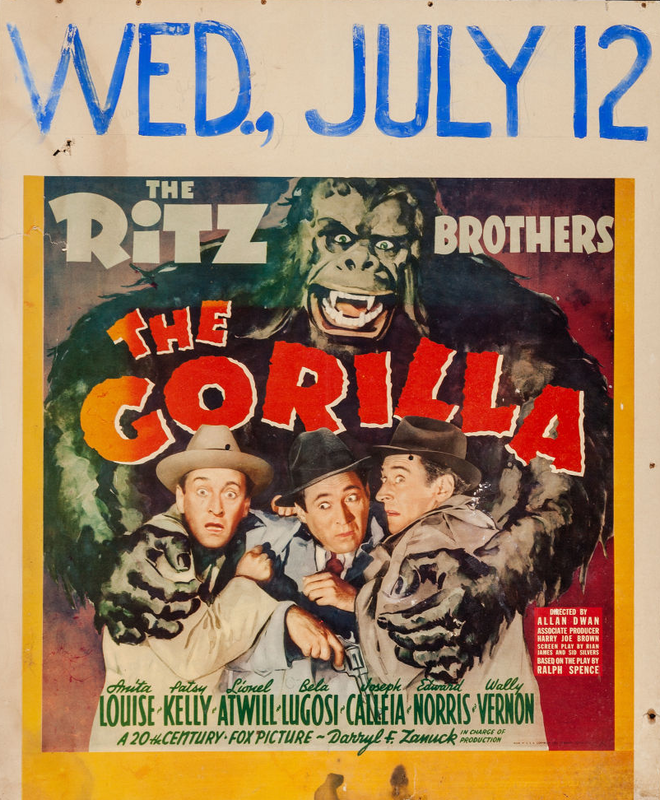 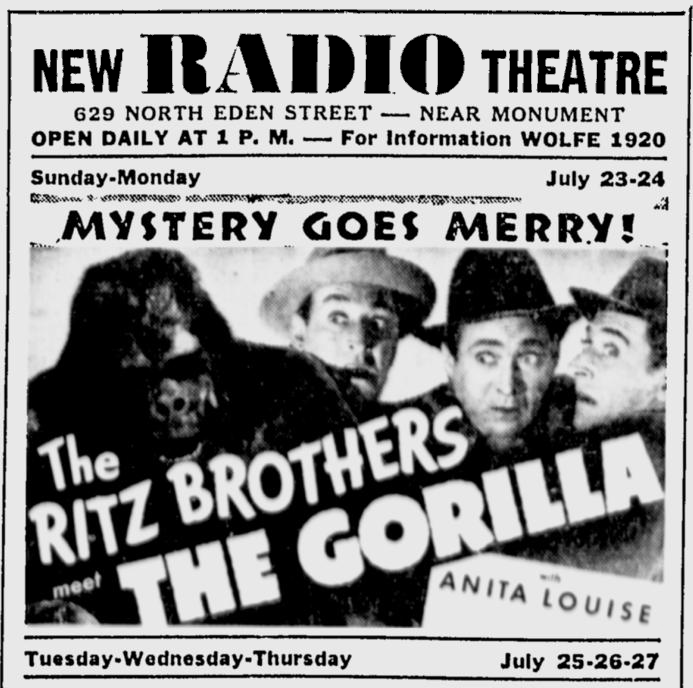 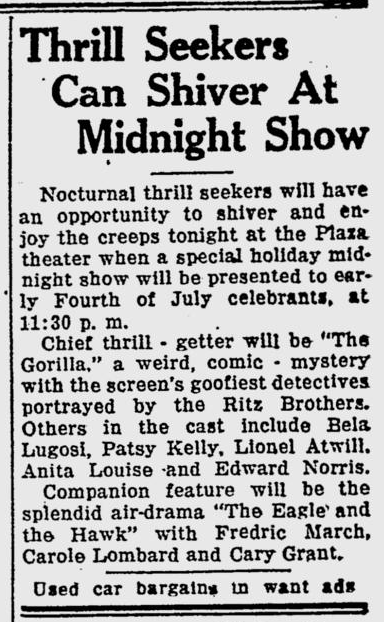 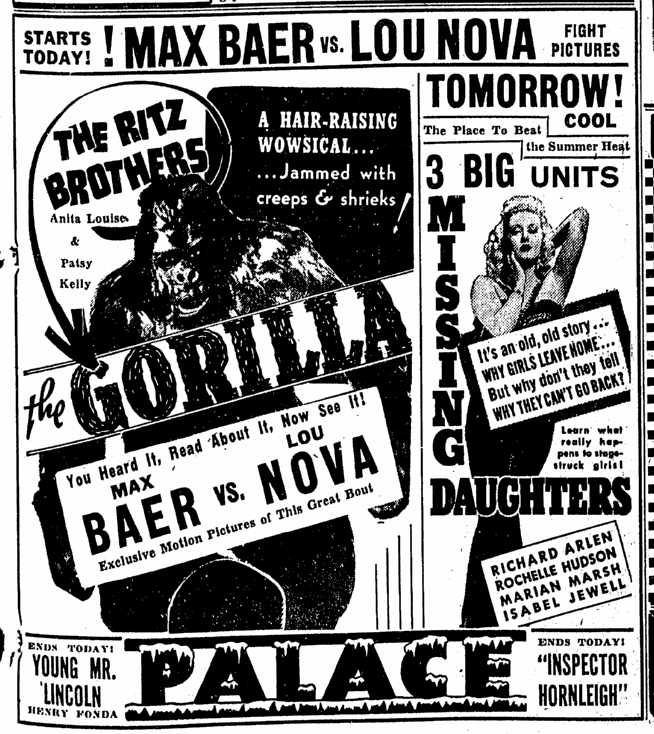 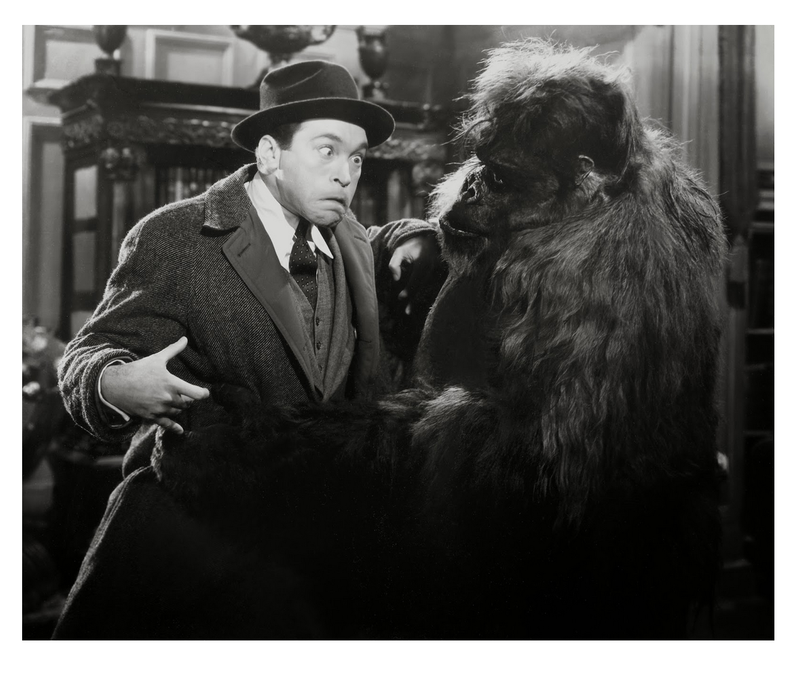 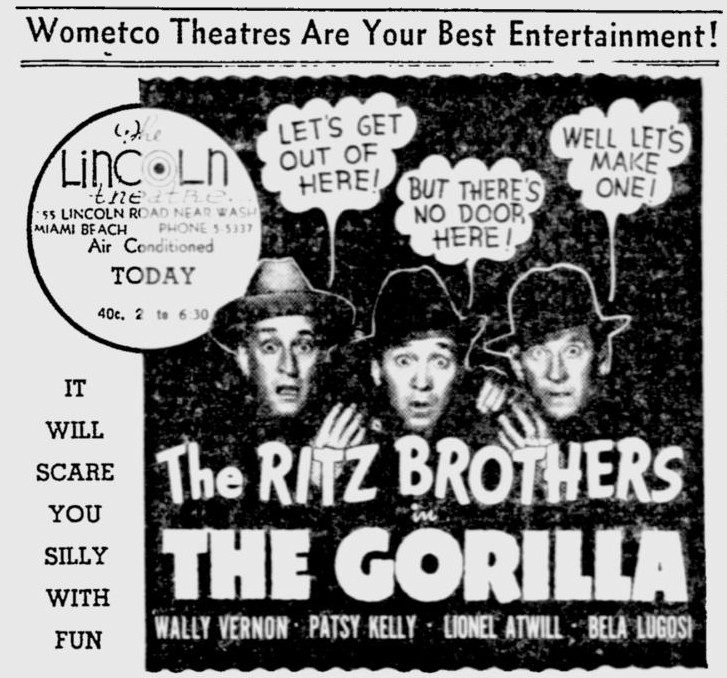 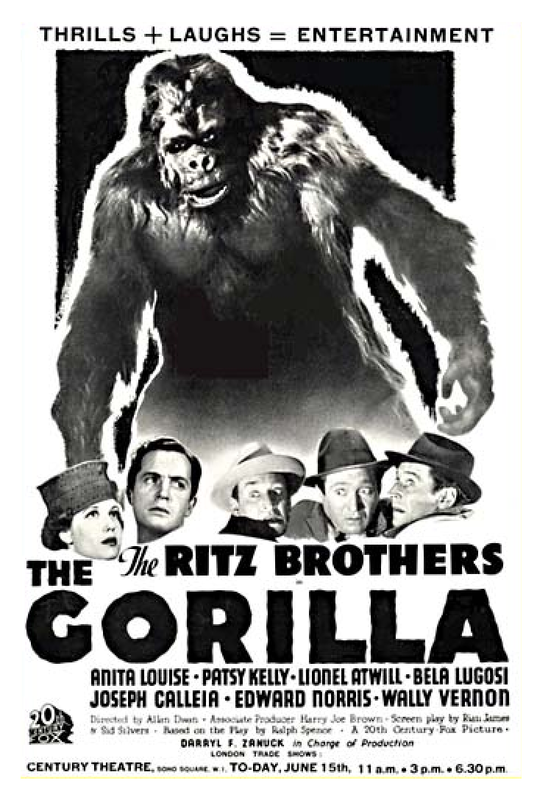 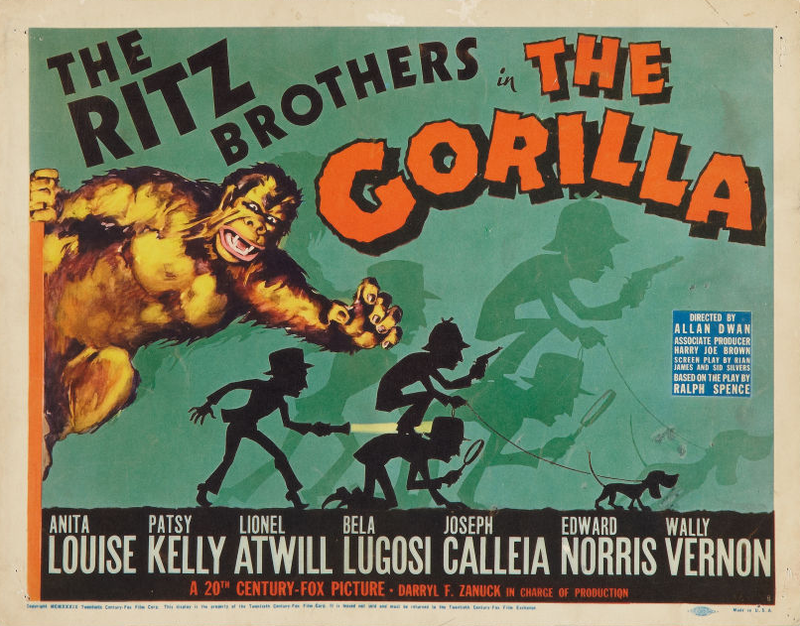 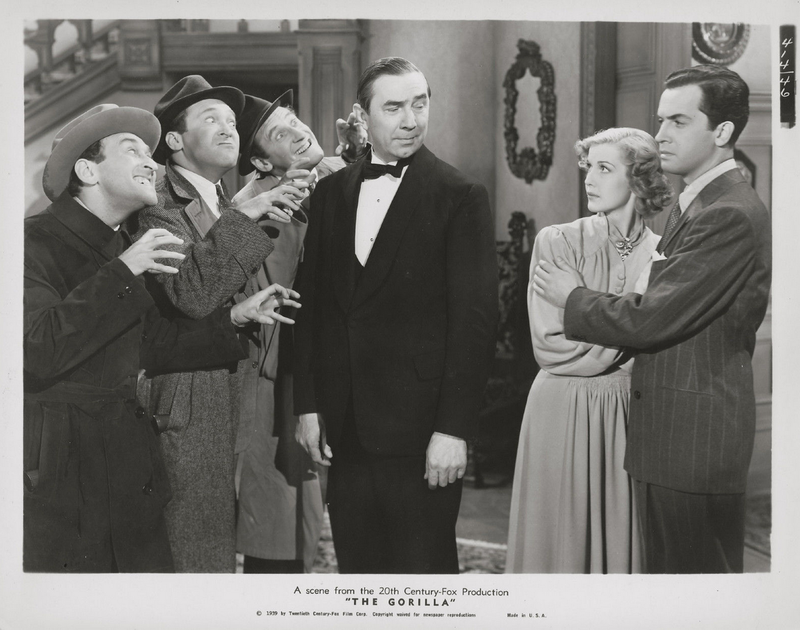 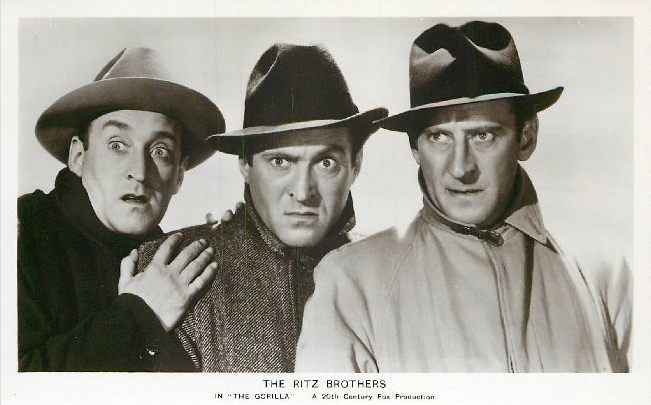 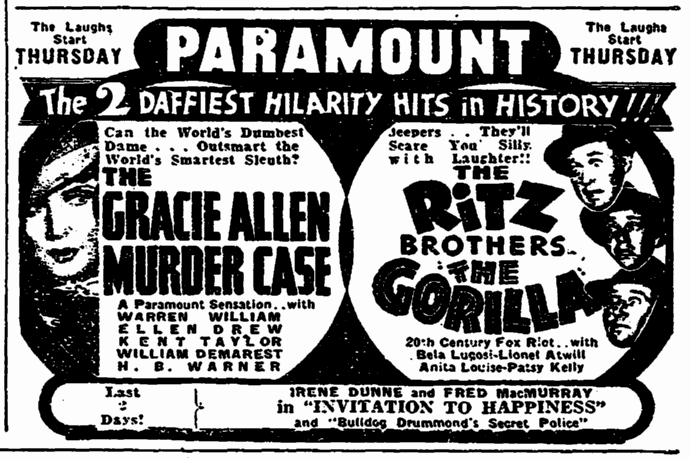 The Ritz Brothers, who revolted on “The Gorilla” set, will be billed about $15,000 for the resulting two day’s delay. 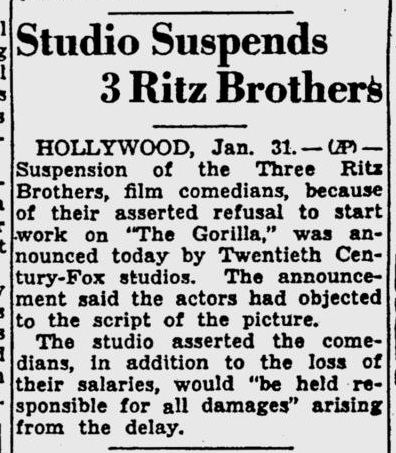 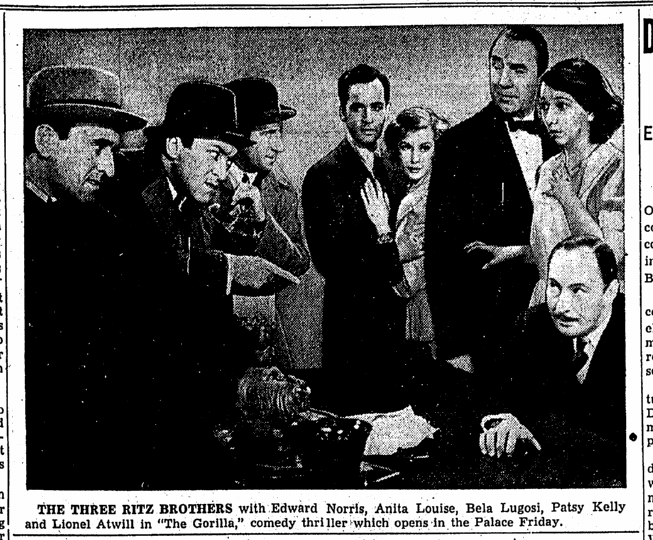 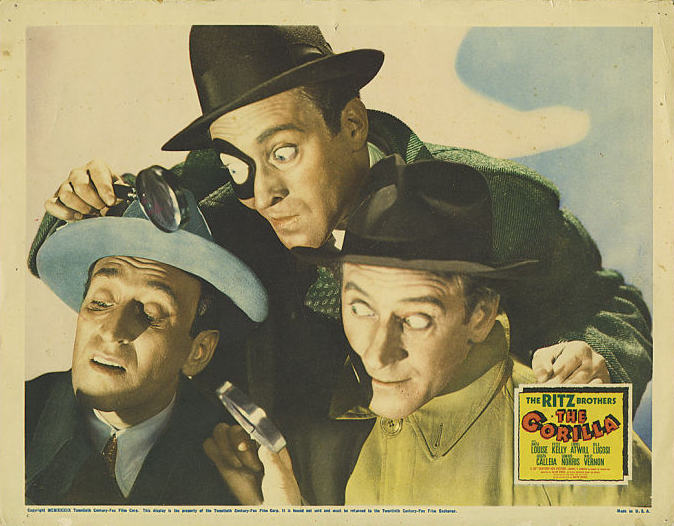 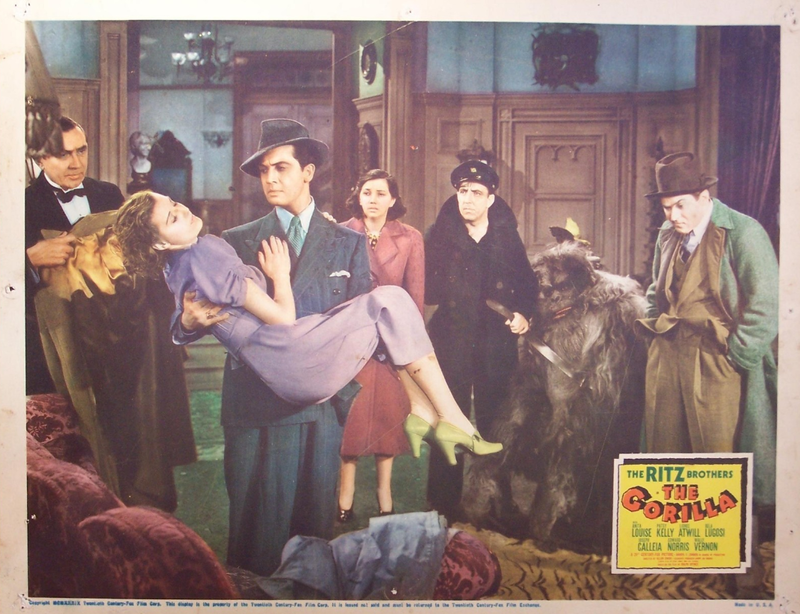 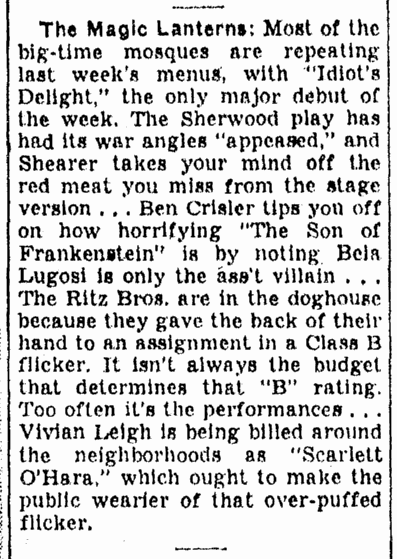 Twentieth Century-Fox has not, we regretfully report, enhanced the standing of the comic muse, nor has it contributed much to the enjoyment of patrons of the Roxy this week, through its comedy treatment of the ancient Ralph Spence chiller tersely titled, “The Gorilla.” The Ritz Brothers—Harry, Jimmy and Al—are there to supply a note of hilarity to the supposedly eerie proceedings, but even their antic buffoonery is not equal to the task. 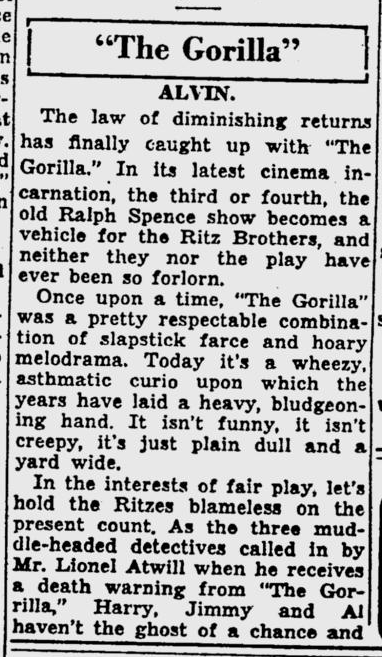 The real comedian of the show, strangely enough, is a gentleman named Art Miles (he’s the gorilla) who pops up every so often emitting strange noises and thumping his hairy chest—courtesy of the prop department—in the best Tarzan tradition. 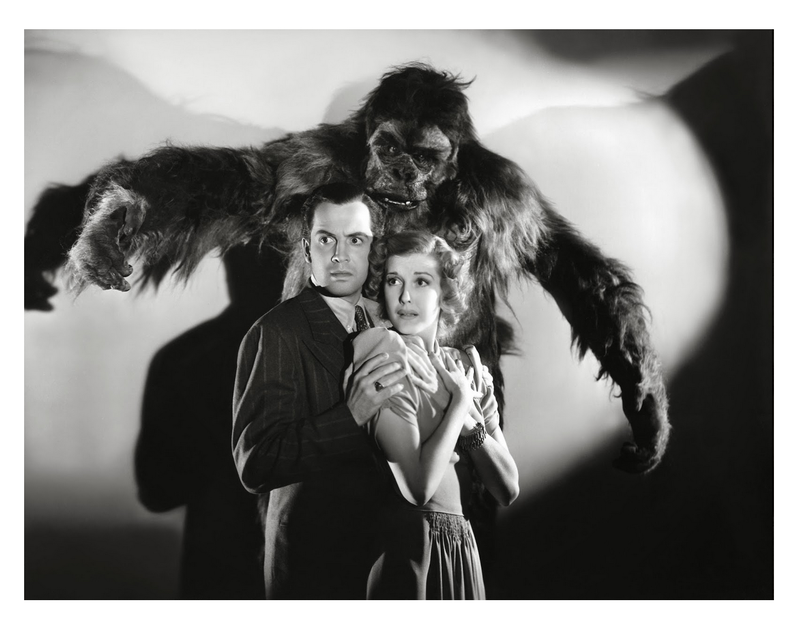 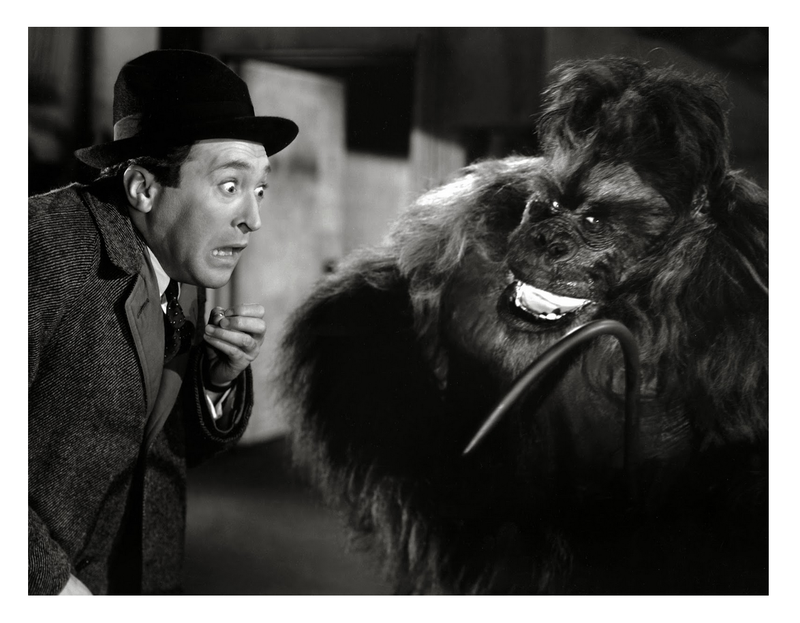 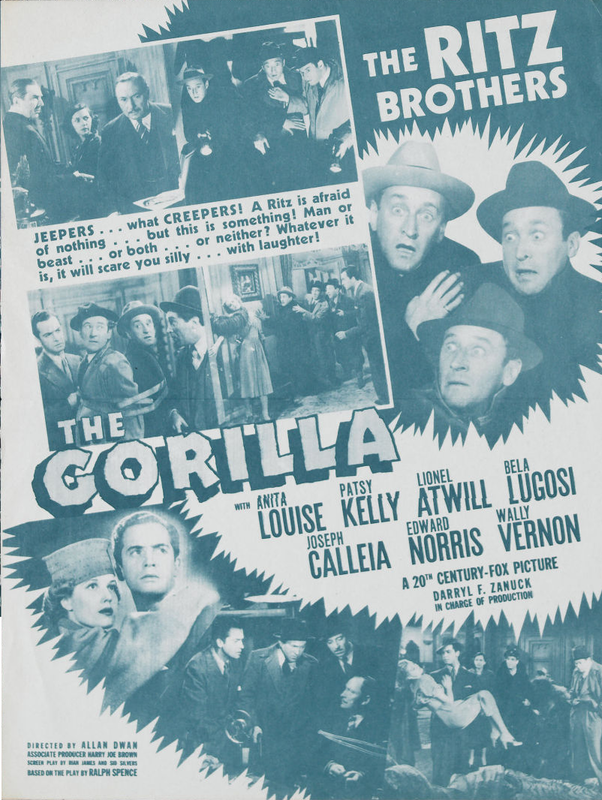 As for the story—well, its the old one about the country gentleman who receives threatening notes from an unknown source signed “the gorilla.” Midnight is the hour of his (Lionel Atwill) doom and the Ritzes arrive at the scene an hour or so before to see that he is properly protected, they, of course, being private detectives. 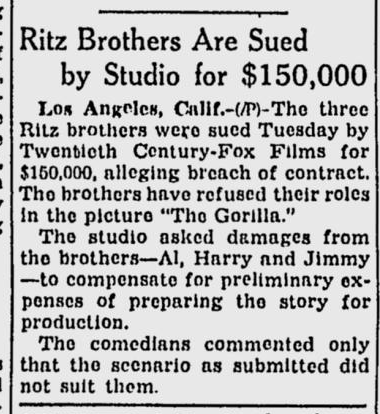 From this point on things begin to happen. 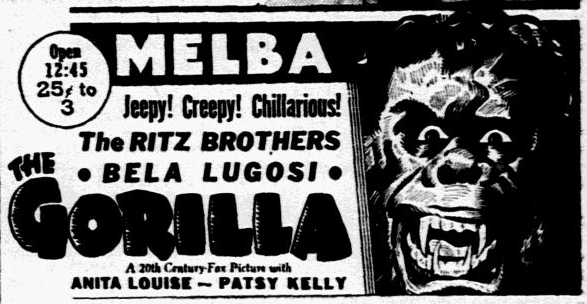 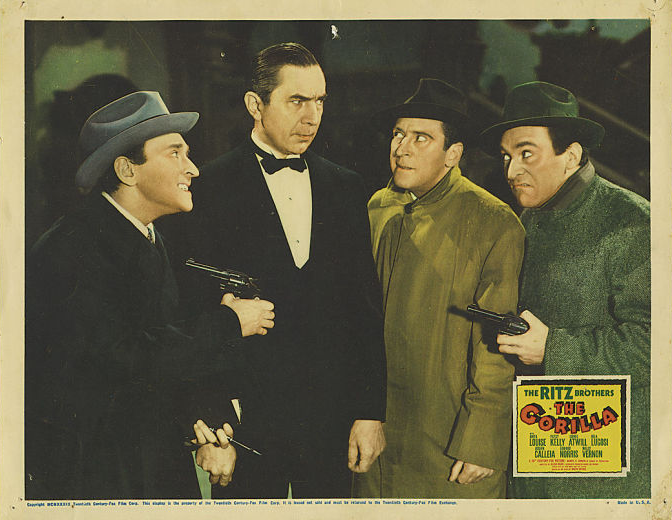 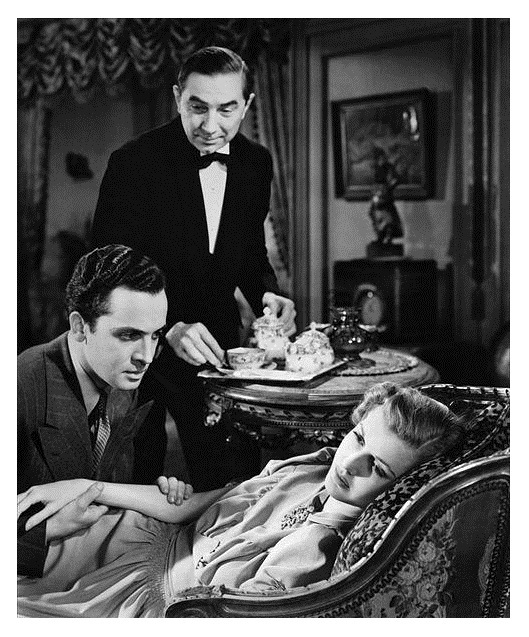 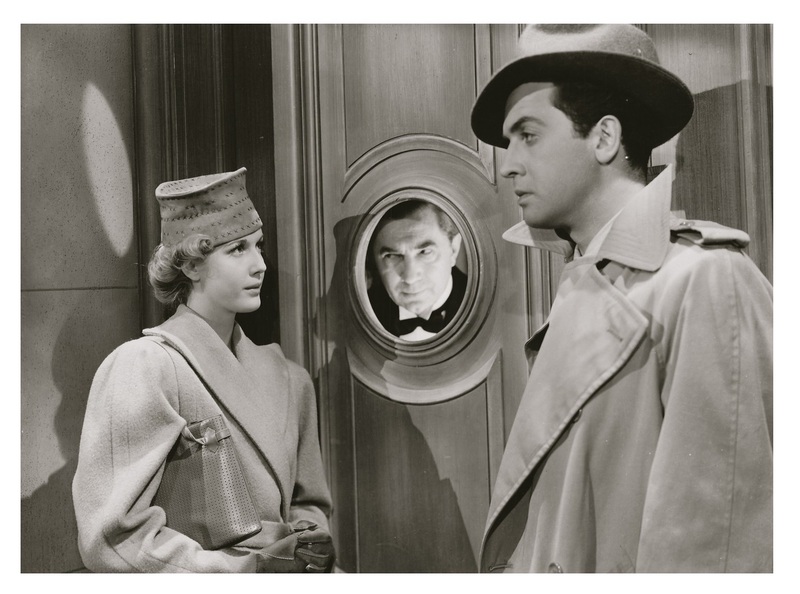 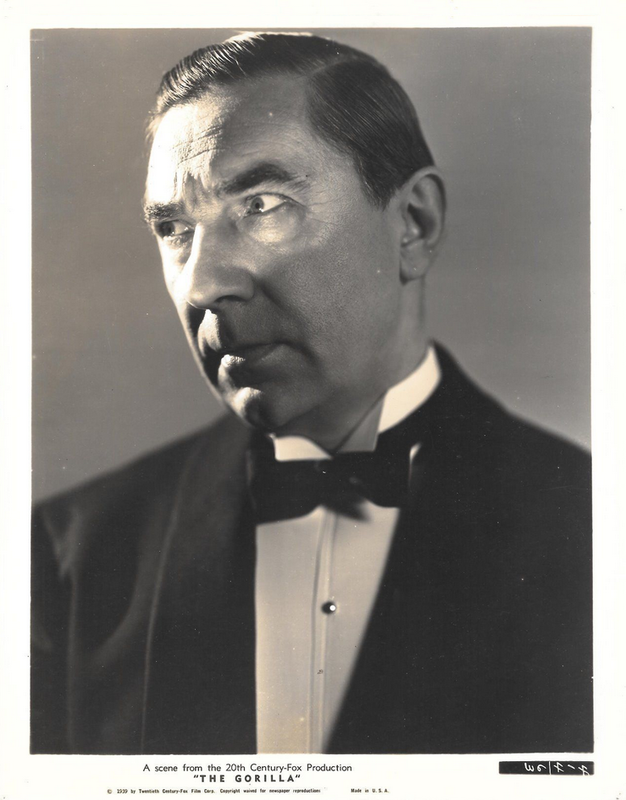 People like Anita Louise and Patsy Kelly shriek themselves hoarse; Mr. Atwill disappears, the Ritz brothers disappear (one by one), Bela Lugosi appears out of the nowhere; secret panels in the walls open and close; flashes of lightning illuminate gloomy rooms. 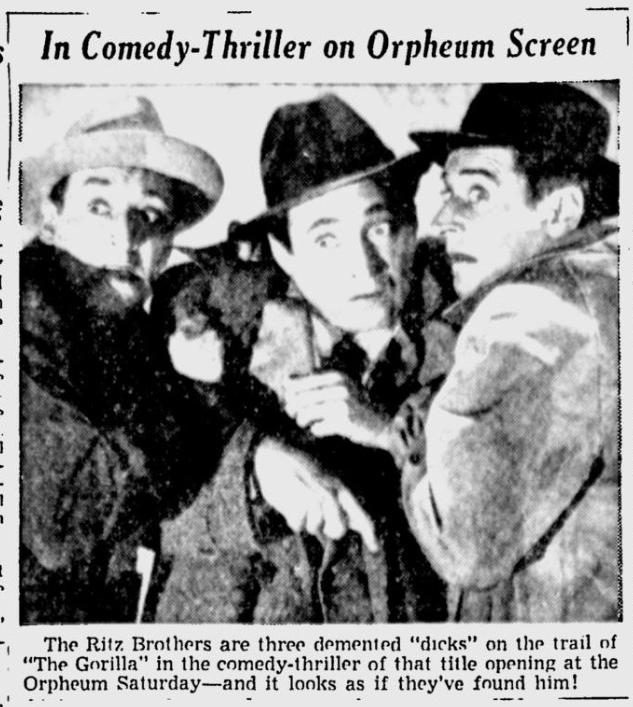 It’s all supposed to be either very funny or shockingly thrilling, depending how you look at it. 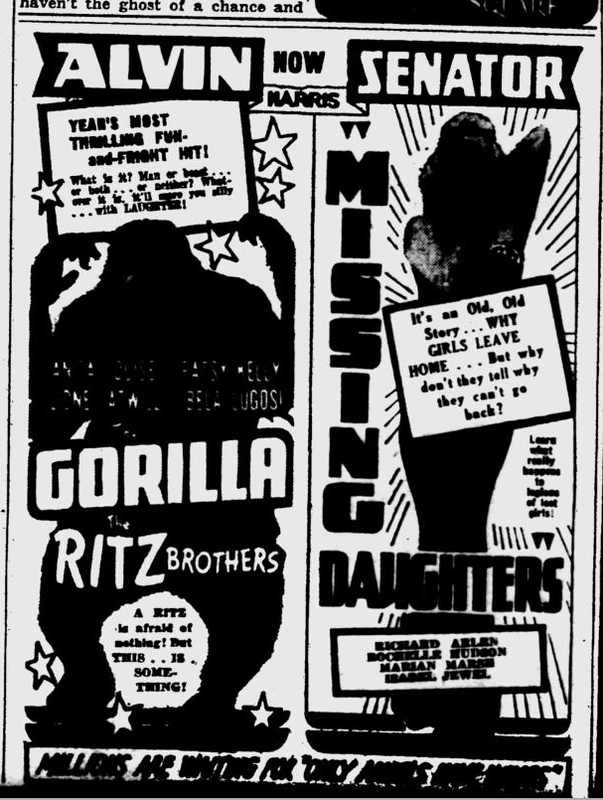 We couldn’t see it either way. 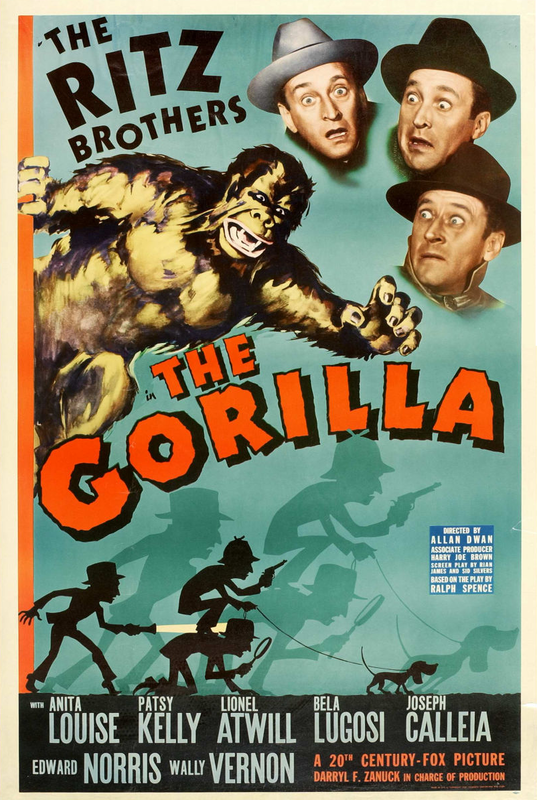 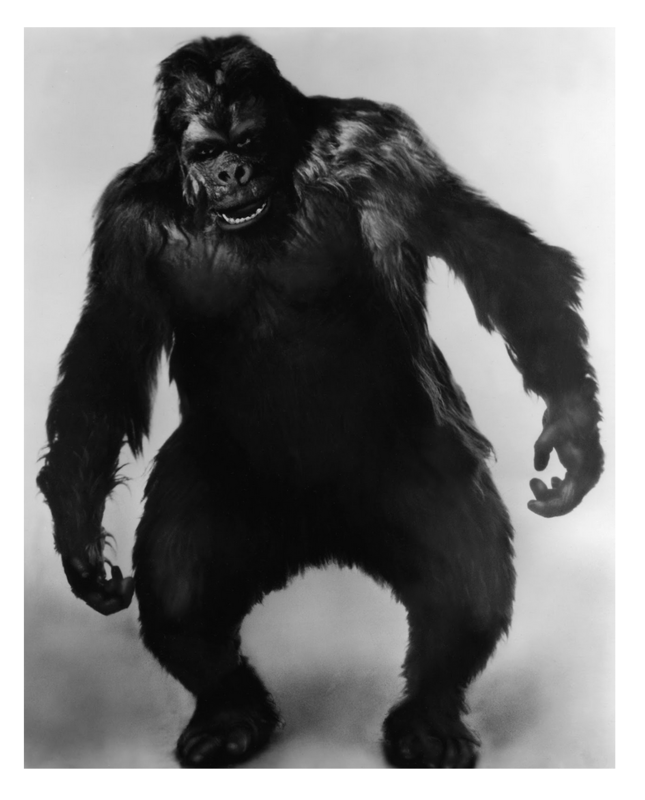 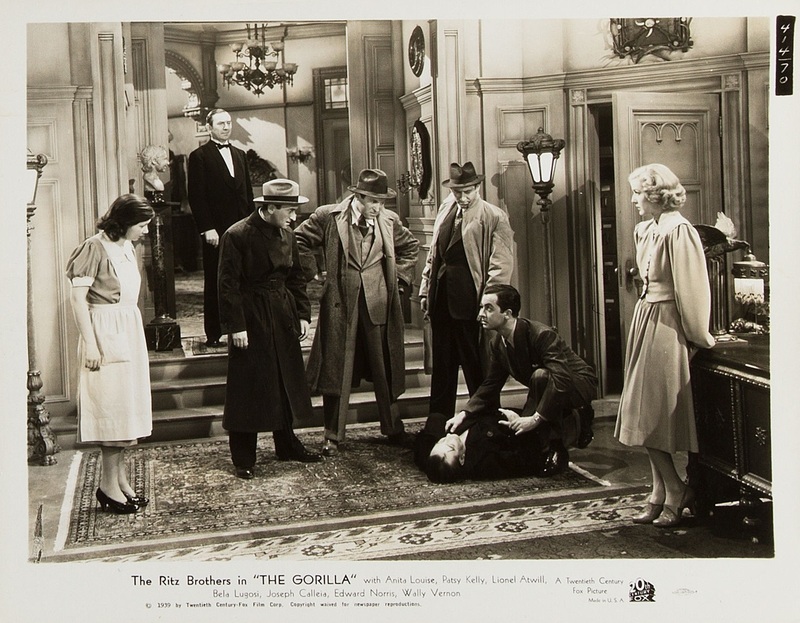 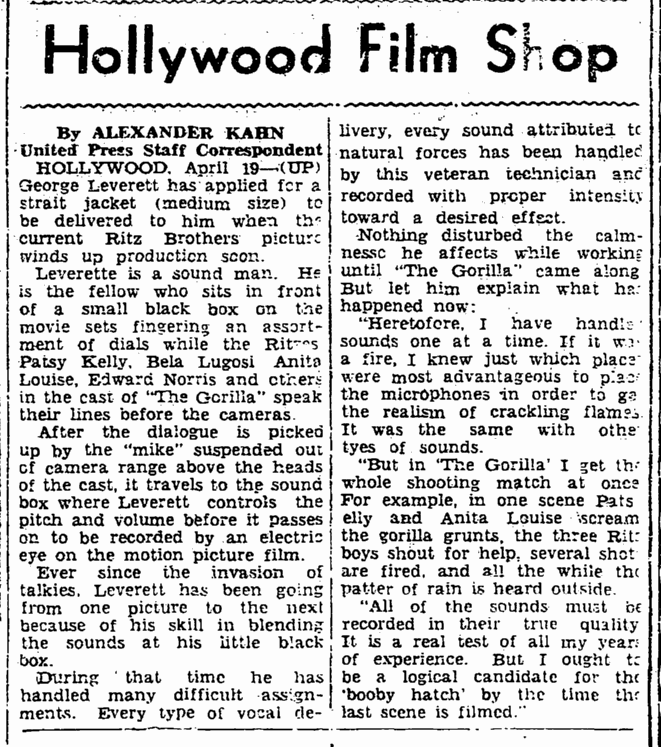 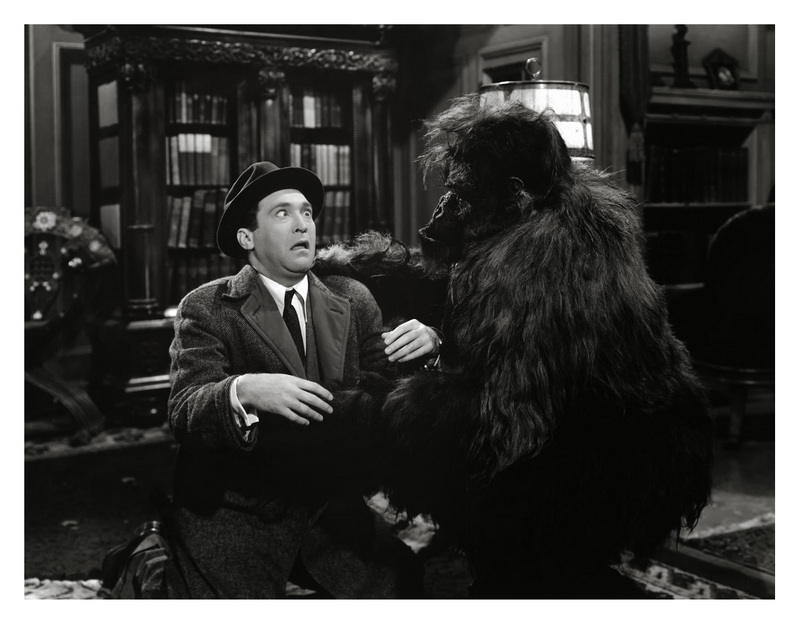 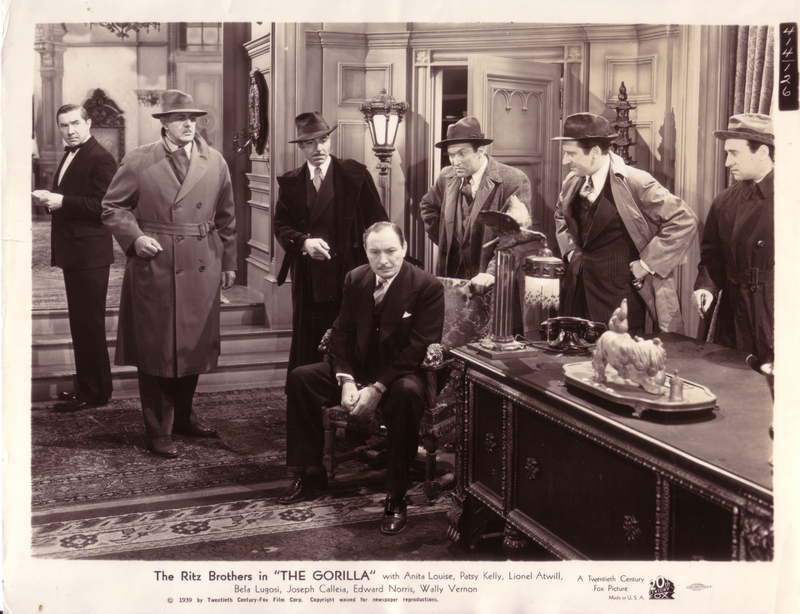 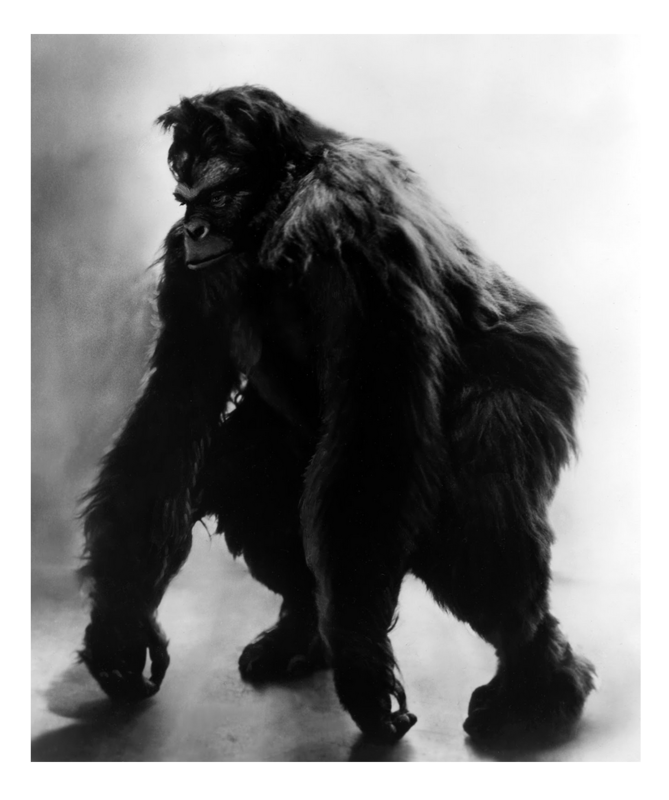 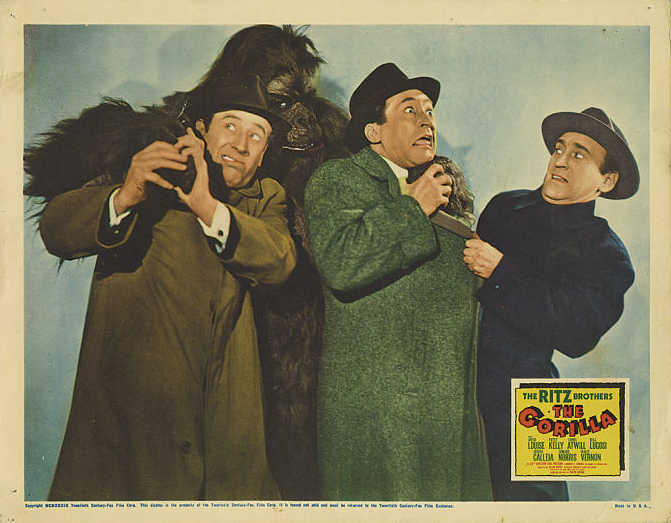 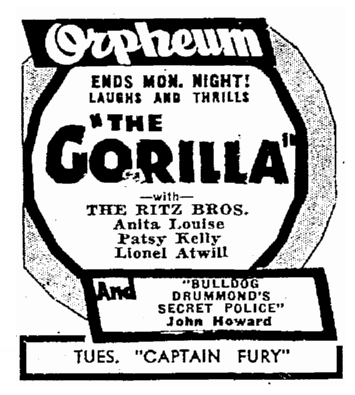 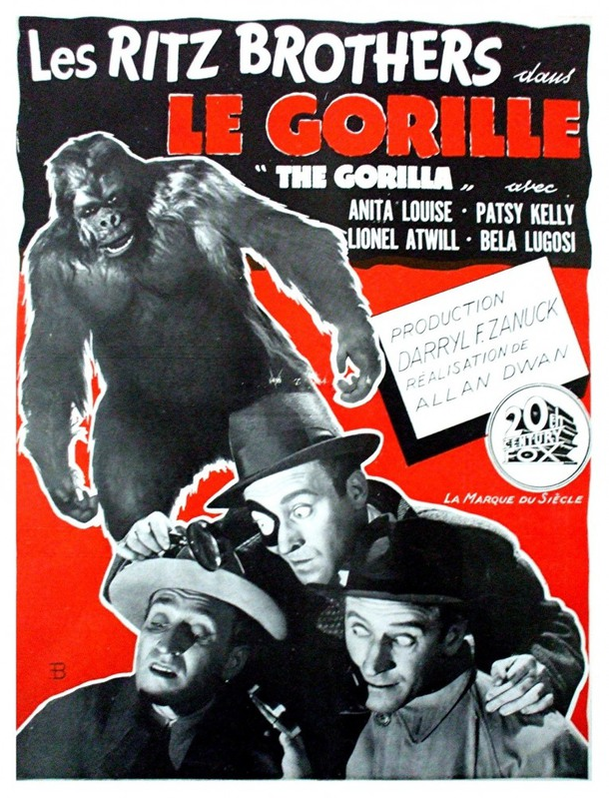 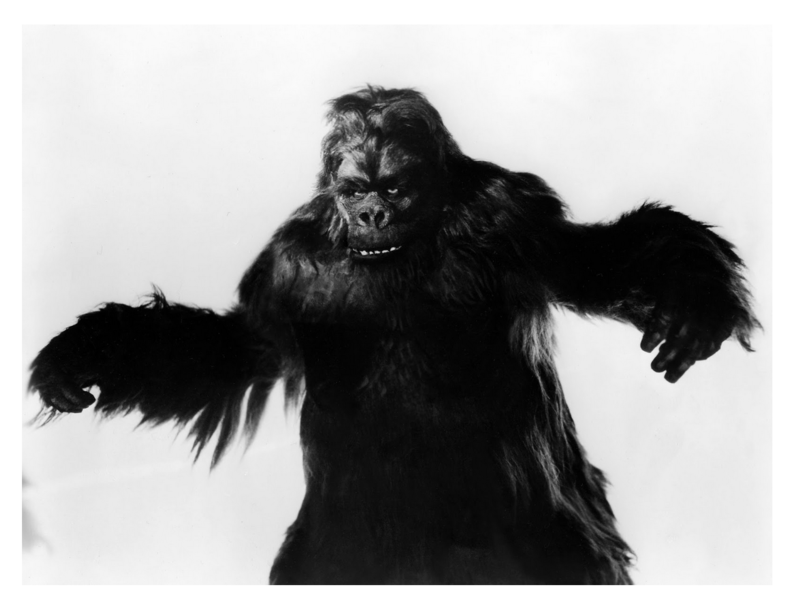 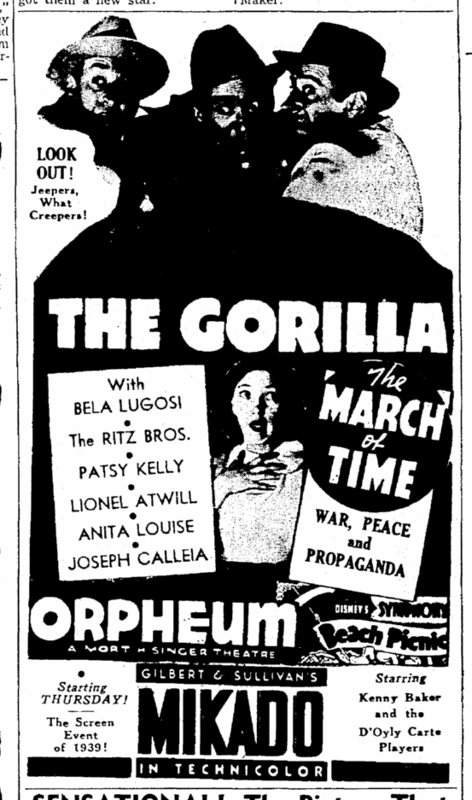 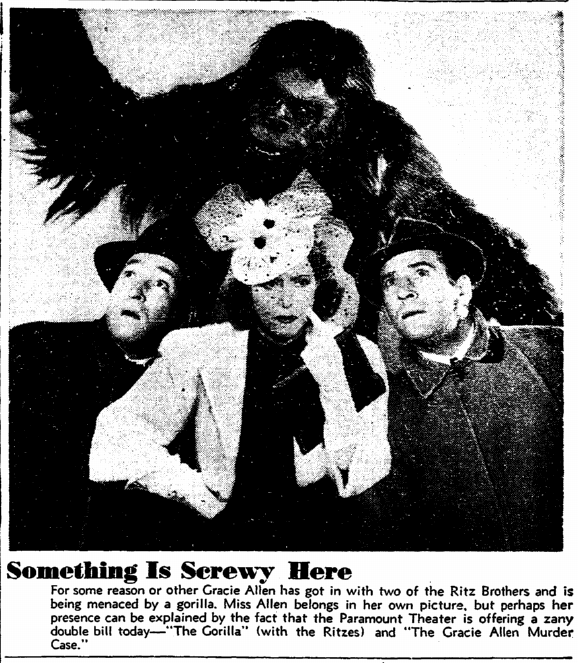 THE GORILLA, as adapted by Rian James and Sid Silvers from the play by Ralph Spence; directed by Allan Dawn; produced by Darryl F. Zanuck for Twentieth Century-Fox. 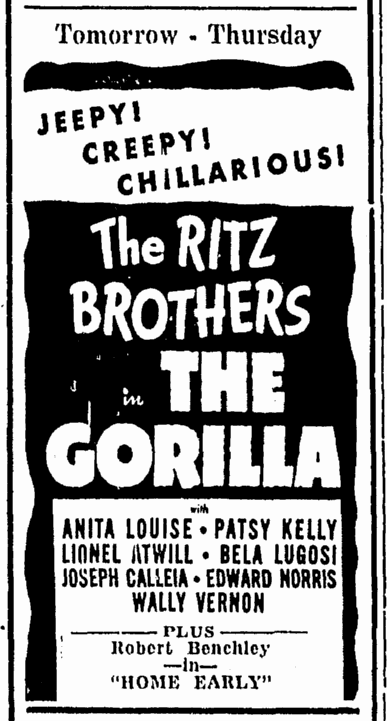 At the Roxy.